First Line:"If I lean back in my chair far enough and fall to the floor, I could knock myself out and have to go to the hospital." 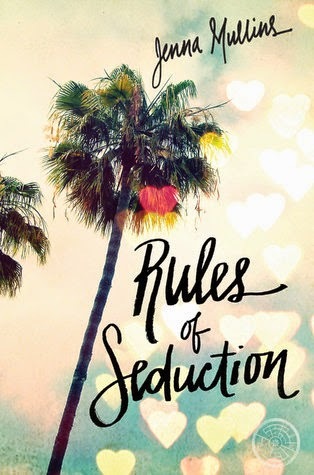 Review: Rules of Seduction was a cute and light-hearted read. Dani is going to Los Angeles with big dreams of one day being the next big thing in Hollywood as far as being a director or a screenwriter goes but when she gets there the job she had lined up no longer exists, luckily she bumps into a childhood friend who moved out to Hollywood to try and become a star also and who just happens to be dating Tate the star of Vamp Camp which is a popular TV show. Elise hooks Dani up as an intern on the set of Vamp Camp but not without wanting something in return. Dani has to seduce Tate to test his loyalty to Elise. I found the book to be very predictable, it was pretty obvious how things would play out but that didn't take away from my enjoyment of reading it. Dani was hilarious, the things that came out of her mouth and her thought process is what really kept me reading. I loved the different sets of lists of rules Dani always made, some were just downright funny and there were even a few rules that I if I kept lists like hers I would add to mine. Tate was such a sweet guy which is why the whole time I felt so bad for him with the way he was being played by Elise and even Dani (although Dani did feel like utter crap the whole time while playing the seductress). Tate was more than what meets the eye and Dani slowly figured that out as they grew to become very close friends. Besides the romance there is more to the book, we also see Dani's world crashing in on her when she realizes Hollywood is not everything it's cracked out to be and the people are really self-centered, the only bright light in her world is Tate but even she knows once he learns the truth that will be over and then there was her roommate Brit who was what a true friend really is...not like Elise that girl was just horrible and I hated how Dani let her talk her into a situation she clearly was uncomfortable in. The ending was sweet, I just expected Tate to give Dani a bit more of a hard time because it seriously was messed up what she was doing. Overall though I laughed quite a bit and I had fun seeing there friendship blossom and Dani trying to seduce him when she didn't have a clue on what the hell she was doing. ~"If you find something funny, laugh. If something makes you sad, cry. If you are being disrespected, leave. Don't let anyone else dictate your emotions." "You said the word 'best' wrong."